C2C Satellite Stage Artists Announced! C2C have announced the artists appearing on the Satellite Stage at C2C 2016! Last year, the idea proved to be a huge success, with Sam Hunt, The Shires, Ward Thomas and Sam Palladio all performing on the Satellite Stage. 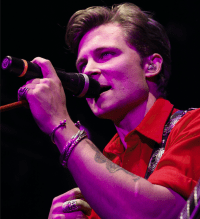 This year, C2C fans will have the opportunity to see 6 artists on the Satellite Stage, including country superstar Frankie Ballard who has had 3 #1 singles on the country airplay chart with ‘Helluva Life’, ‘Sunshine and Whiskey’ and ‘Young and Crazy’. New artist Maren Morris will also be performing, following her stint as opening act for Lady Antebellum’s Charles Kelley in the US. Friday – Ashley Monroe, followed by a special guest (not announced yet).